For the region, see Daggerfall (Region). The city of Daggerfall is the capital of the correspondent Kingdom of Daggerfall, located in southern High Rock in the Iliac Bay. Daggerfall City is also the capital of the entire imperial province of High Rock. The last census, in the year 3E 401, lists the population at over 110,000. 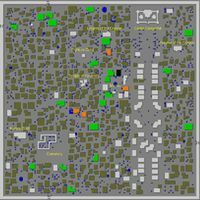 It is always difficult to find an exact number, but the capitol city of Daggerfall certainly outnumbers her rivals, Sentinel and Wayrest. Daggerfall, by tradition, is said to refer to the knife the first chieftain threw to form the borders of his lands. But there are other legends that may have equal validity. The city of Daggerfall is among Sentinel City and Wayrest City one of the biggest cities in the Iliac Bay. The city is surrounded by a mighty city wall. Four city gates, one for each cardinal direction, provide unrestricted access to the urban area from 06:00 to 18:00. 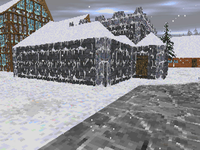 The city houses numerous Service Buildings and Taverns.The Fighters Guild, The Knights of the Dragon, the Mages Guild and the Temple of Kynareth can also be found within the city. 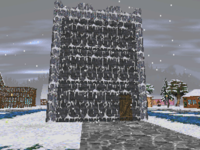 The most prominent structure of Daggerfall City is Castle Daggerfall. The castle itself is located near the north-wall of the city more to the east than to the west. In the front end of the castle is an ample parkway and a major road leads all the way from the castle's entrance to the south-wall of the city. The castle itself is surrounded by a moat filled with water and the only access to the castle's interior is via the main entrance in the inner courtyard. "All are free to petition his highness at this time. Do not stray from the audience chamber lest ye have royal blessing to do so. Always speak politely to the king and queen, and above all, cast no spells while within these walls. Do ye agree with these terms?" Agree to not cause trouble, and the guard opens the doors to the throne room. So long as you follow the rules, the guardians within will not be hostile. 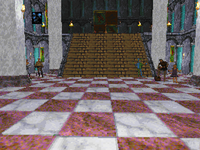 Two royal knights flank the entrance to the throne room, where the court of Daggerfall spends its time. The royal couple, King Gothryd and Queen Aubk-i, stand near their thrones on an elevated platform. Among the courtiers are minor nobles, bards and jugglers, and adventurers. In addition, a number of royal knights and battlemages are present and will attack anyone who violates the terms set by the entrance guard. 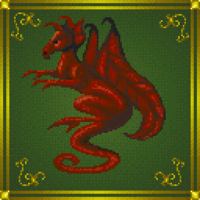 Among the notable courtiers are Lord and Lady Bridwell, Mobar and Lord Provlith, Sentinel's ambassador to the Daggerfall Court. The clatter of pots and pans and the smell of fresh baked bread waft through this door. A small heraldic device above the door handle clearly marks this as the private chambers of a member of the royal family. This is the private chamber of the Dowager Queen Mynisera; it should be noted that entering her chamber under any circumstances is considered trespassing. So if you have business with Mynisera, do it quickly then leave the castle as fast as possible. Otherwise, you may find yourself overwhelmed by the castle guards. 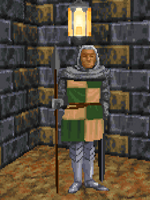 Advancing further into Castle Daggerfall is also considered trespassing, so be prepared to be attacked by any guards you meet along the way. However, the Main Quest will lead you into the depths of the castle's dungeons, so it is necessary to do this at least once. Any time you reenter the castle after being attacked by the guards they will no longer be hostile. At least, until you commit another act of trespassing or become violent. The city houses two garrisons of The Knights of the Dragon. One garrison is located southwest of the castle and the other is located to the castle's southeast. Neither Sentinel nor Wayrest have a similar military presence located within their capitals. Members of the order and non-members can receive their quests from the local commanders. Members may as well receive a free piece of armor in case of a promotion. If a member gets promoted to the rank of a Paladin, he or she will even get a free house within the city. The market is located southwest of the castle. Two Alchemists, an Armorer, a Bank, a Bookstore, a Clothing Store, a General Store, four Taverns and a Weapon Smith can be found there. More shops of various quality can be found in the vicinity of the market including Armores, Jewelers, General Stores, and Pawn Shops. Two additional banks are further to the south of the market. Kynareth is the regional deity of Daggerfall, therefore her temple is also present within the city. The Temple is located west of the market and travelers are welcome to receive comfort and healing of their diseases. In return the Temple asks for a donation to continue its beneficial works. Members as well as non-members may also receive quests from the local leader. Further services are reserved for members of the Temple of Kynareth or the Kynaran Order. The Fighters Guild is located north of the Temple of Kynareth, only a stone's throw away. Members and non-members of the Guild can receive quests from the local leader there. Members may also purchase training sessions, get their equipment repaired or stay for free at the Guild's bunks. The Mages Guild of Daggerfall is located in the southwestern part of the city, near the west-wall. The reputation of the local Guild is quite high, hence the prices for its services can be considered high as well. The Guild sells Spells to everyone who has the sufficient amount of gold. The service to identify unknown enchantments of magical items is also available to everyone who can pay for this service. Members of the Guild and non-members can receive quests from the local leader. The access to further services is reserved for members of the Mages Guild. The Werebeast: Kill a werewolf for Cyndassa. The Emperor's Courier: Locate the Emperor's Courier and learn what happened to the letter. Mynisera's Letters: The Dowager Queen is smuggling letters out of Daggerfall. This page was last modified on 24 August 2018, at 06:15.